An IBC table creates new marks for fire rated glazing assemblies. The purpose is to make sure that the right glazing and framing goes in the right place. The new marking replaces test standard numbers with letter identifications. It’s about to get a lot easier to use the right glazing product in the right application, thanks to the 2012 IBC Table 716.3 Marking Fire Rated Glazing Assemblies. The new table provides architects, specifiers, installers, plan reviewers, and building officials with an easy reference that shows which performance standard(s) a product meets along with its duration rating. The new marks replace test standard numbers with letter identifications, which are then used in tables for Opening Fire Protection Assemblies, Ratings and Markings (new Table 716.5 revised Table 715.4) and Fire Window Assembly Fire Protection Ratings (Table 716.6). The same marking system was included in the 2012 edition of NFPA 101 Life Safety Code. Prior to the 2006 IBC, fire rated glass was required to have labels showing the testing agency, the test standard and the test duration. Under the new marking system, the test standard is replaced with letters that refer to the performance standard a glazing product meets. The testing agency and test duration remain. W means that the glazing has been tested to the fire wall test standard (ASTM E119/NFPA 251/UL 263) and is fire resistive. H means the product passes the hose stream procedure. T means the glazing meets the temperature rise limits required for temperature rise doors used in exit enclosures and passageways. OH means the glazing has been tested to the fire window test standard (NFPA 257) and meets both the fire endurance and hose stream requirements of the test standard. As before, a two or three digit number shows the fire rating duration in minutes. Some products may have been tested to more than one standard, which means that this glazing will have multiple markings. For example, fire resistance glazing that passes both the wall fire test and fire door assembly test will carry multiple markings of: W, D-H-T. This product can be used in large vision panel sizes in 60 and 90 minute doors, where a fire protection rated product, such as safety wired glass and safety ceramic which are marked only D-H, would be limited to 100 square inches. The new marks not only help code officials easily identify if the proper glazing is used in the proper application, but they also provide architects, specifiers and even contract glaziers with helpful keys to fire rated glazing applications specified in Tables 716.5 and 716.6 of the 2012 IBC. The tables have been revised in accordance with recommendations by the ICC ad hoc study committee to incorporate the new letter markings and to add information distinguishing fire protection and fire resistance glazing. For the first time, Table 716.5, addressing fire protection rated assemblies, ratings and markings, lays out the vision panel size limits and adds a column that specifies the sidelite and transom rating requirements. The new table differentiates fire protection rated products from fire resistance rated products, and helps the end user to: identify size limits affecting fire protective glazing, determine when fire resistance rating products must be used for larger applications, and applications where the code allows only glazing that meets the fire wall test standard. The new 2012 IBC fire window rating Table 716.6 has been similarly expanded to clarify where fire protection rated products are allowed and where they are not, and lays out where fire resistance rated glazing must be used (e.g., 2-hour interior walls). 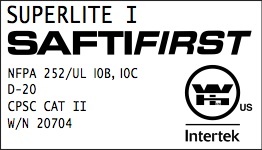 SAFTIFIRST has modified its labels to comply with the new marking system in 2012 IBC Tables 716.3, 716.5 and 716.5. Below are some examples of different labels that accompany SAFTI’s glass products. SuperLite I glazing can be used in 20-minute doors. 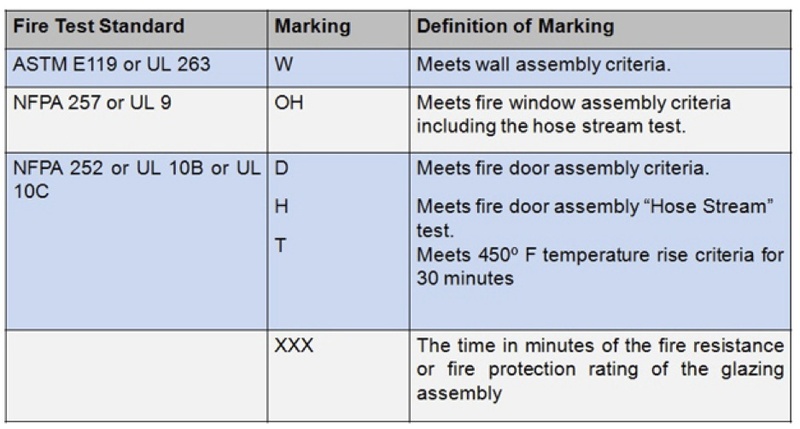 The fire rated glazing bug carries the “D” mark (see mark on the left) to indicate that it meets the fire door test standard (NFPA 252). SuperLite I has the strength of tempered glass, easily meeting the CPSC Cat II safety requirement without having to be filmed or laminated. SuperLite II-XL 45 is used in the 45-minute sidelites. This glazing product has an “OH” mark, meaning that it meets both the fire window test standard (NFPA 257) and the hose stream test. 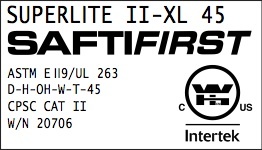 Like SuperLite I, SuperLite II-XL 45 has the strength of tempered glass and meets the CPSC Cat II safety requirement without having to be filmed or laminated. In an exit enclosure/stairwell, architects can increase the vision area in a 60 minute temperature rise door by using SuperLite II-XL 60 in HMTR framing. Used together, the door assembly meets the “T” criteria, indicating that it meets the temperature rise limitation within the first 30 minutes of the test. The 450º F limit is the most common, although some applications may require the more stringent 250º F limit. Transparency can be also extended to the wall by using SuperLite II-XL 60 in GPX Framing. Both the glass and the framing meet the required “W” criteria, which indicates that it meets the wall assembly test standard (ASTM E119). Ceramics and wired glass, which are rated up to 180 and 90 minutes respectively, cannot be used in this application because they do not have the “W” marking. 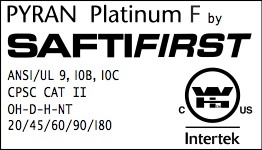 PYRAN Platinum F. Fire rated ceramics are limited to 100 square inches in 60 and 90 minute temperature rise doors because they do not protect against radiant heat. Even though this glazing is rated up to 180 minutes, it lacks a “T” marking because it does not meet the temperature rise requirement for this application. Instead, it has the “NT” mark indicating it is non-temperature rise. While the 2012 IBC table changes go a long way toward clearing up confusion about where and when fire rated glazing can be used, there is still work to do. The ICC’s ad hoc study committee continues to meet. One area sure to warrant additional study are fire door assemblies.The 2012 IBC changed the code to remove an exception allowing fire protective vision panels in fire doors used in exit enclosures and passageways if the building was fully sprinklered. In the 2012 IBC, Section 716.5.5.1 makes it very clear that fire protective glazing cannot exceed 100 square inches whether or not there are sprinklers. Another inconsistency that has yet to be addressed is the challenge faced by test agencies testing assemblies involving a 20-minute door and 45-minute sidelites and transoms, which the codes require in 1-hour exit corridors. Because the door will fail before the sidelites, test agencies cannot actually test the assembly that is required by the code and installed in the field. Instead, they test the assembly without the door.